Four-color process printed on Side 1 of 18pt C1S Semi-Gloss stock. Coated with Aqueous Gloss. Bright green ink symbolizes growth and positivity for Grossmont Union High School District. 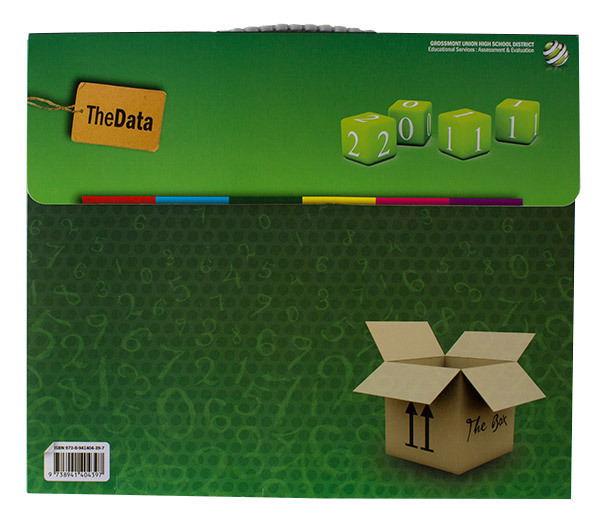 An open cardboard box spews a jumble of numbers out onto the panels of the design, hinting that this package presents data. Underneath the escaped numbers, honeycomb and grid patterns create the illusion of texture to make the data seem more tangible. A white blank on the left side lets administrators write individual recipients' names on the boxes to give the presentation a personal touch. Side 1 printed with four-color process and 1 PMS color using heavy coverage. 20pt C1S White Semi-Gloss stock coated with Soft-Touch Lamination. 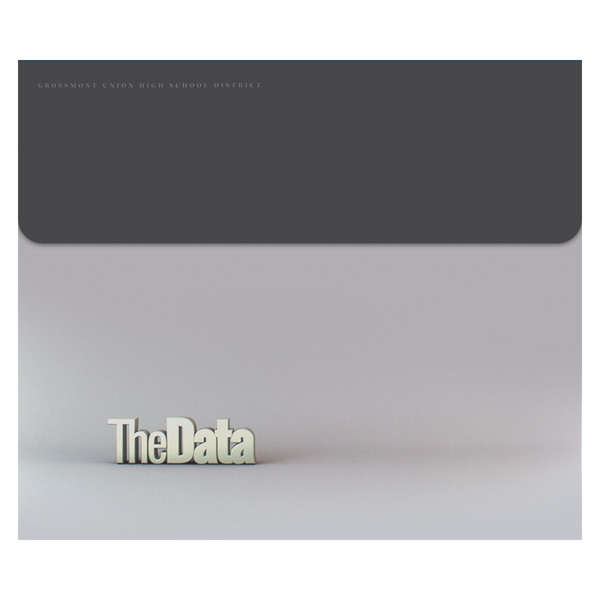 A collection of gears implies progress and innovation, while their gray coloration makes this data presentation package feel industrial and futuristic. 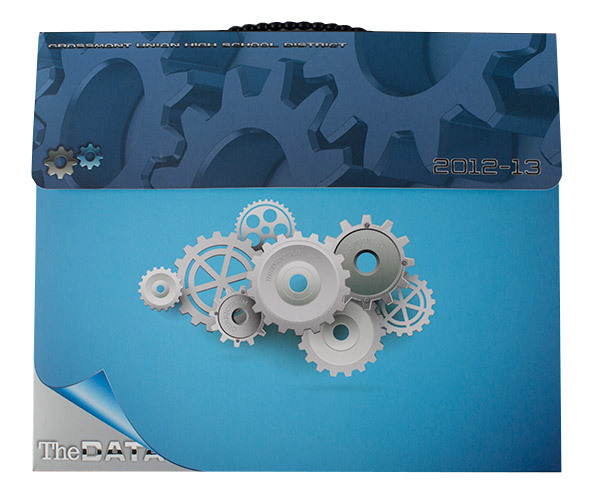 A light blue backdrop balances the darker blue flap, which is covered in large gears for a 3D effect. The bottom left corner appears to be lifted, revealing the words "The Data" to emphasize Grossmont Union High School District's data gathering campaign. On the back cover, a collage of quotes offers insight about the importance of information and data. Four-color process printed on Side 1 of 20pt C1S White Semi-Gloss stock coated with Aqueous Soft-Touch. Side 2 printed with 2 PMS colors. Grossmont Union High School's presentation box uses a color scheme of gray and blue to suggest professionalism, security and reliability. The phrase "The Date" appears in 3-D letters on multiple sides of the box, while Grossmont's logo, URL and slogan appear on the back. With a 2" carrying capacity, this product has room for even the thickest of 11" x 8 1/2" packets, catalogues, or manuscripts. A handle at the top makes it easy to grab and go, so you never have to slow down or struggle with unwieldy stacks of paper. Best of all, you can customize the exterior to match the contents. Imprint the outer panels—even the sides, top, or bottom—with your original photography, illustrations, or brand information. Give each panel its own design, or create a continuous design for a 360-degree viewing experience. Coating: Free of charge: Overall Gloss, Satin or Matte Aqueous. Additional charge: Lamination. Dimension Closed: 12" x 10"
Dimension Open: 12" x 15 3/4"